1. As relayed by several outlets, Cornell just received a very generous $50 million donation from telecommuncations giant Verizon. I might make more news about this, but this donation is strictly for the shiny new tech campus down in New York City. The “Verizon Executive Education Center”, in the left of the above render, will be part of the first phase of the campus, set to open in 2017. This goes along with a 6-story, 236,000 sq ft building design by Weiss/Manfredi, and a 4-story, 188,600 sq ft building by Morphosis Architects, both of which are already underway. 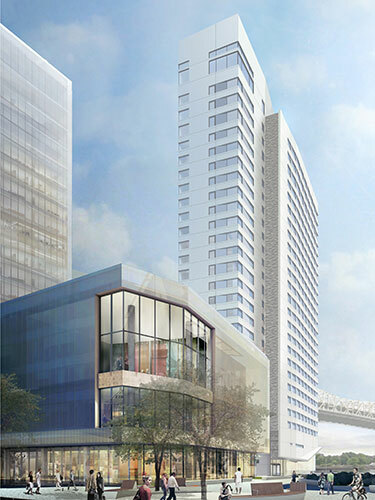 The skyscraper on the right of the render is a 26-story, 500-room dormitory for students and staff designed by Handel Architects; while not yet underway, it is also slated for a 2017 opening. A design for the tall building on the far left has not been released. I’d like to see a breakdown of what proportion each campus received from Cornell’s $546.1 million in donations. 2. Looks like some Sun writers decided to do some digging regarding the potential Fine Arts library relocation and expansion. There’s not a whole lot more to add since the Ithaca Voice article; just that the timeline and final design haven’t been set, although the renovation is a “key academic priority”. Students of the AAP school also have mixed opinions about the growth of the library and the possible loss of studio space. But don’t fret dear readers, if a render comes out, it and any pertinent info will be shared here. 3. 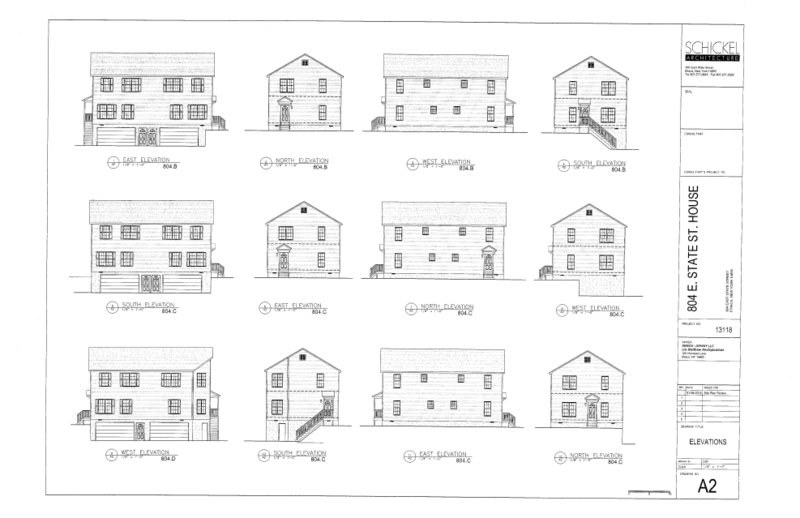 A subdivision filed with the city of Ithaca indicates plans for a new two-family, 6-bedroom home at the intersection of Oak Avenue and Oneida Place. The house would be built on land that currently serves as a rear parking lot for 424 Dryden Road. Application here, drawings here. 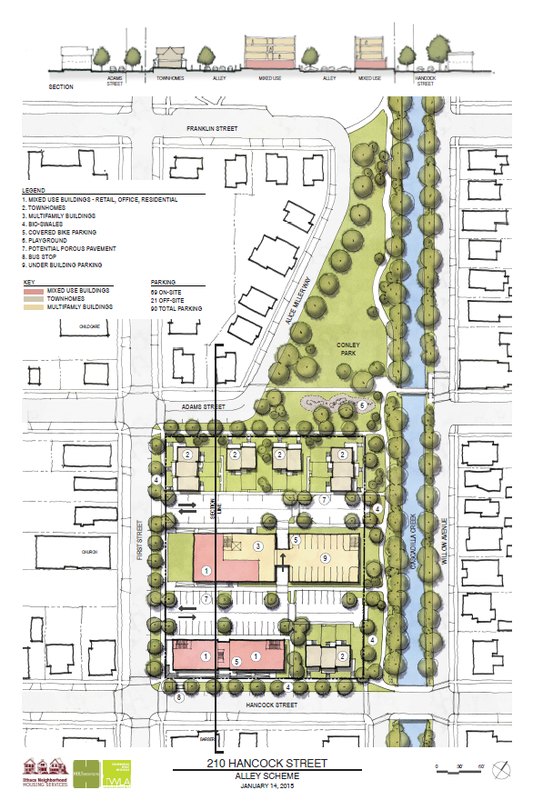 The site falls into the CR-2 Zone of the Collegetown Form District, meaning 2-3 floors, and pitched roofs and porches are required. 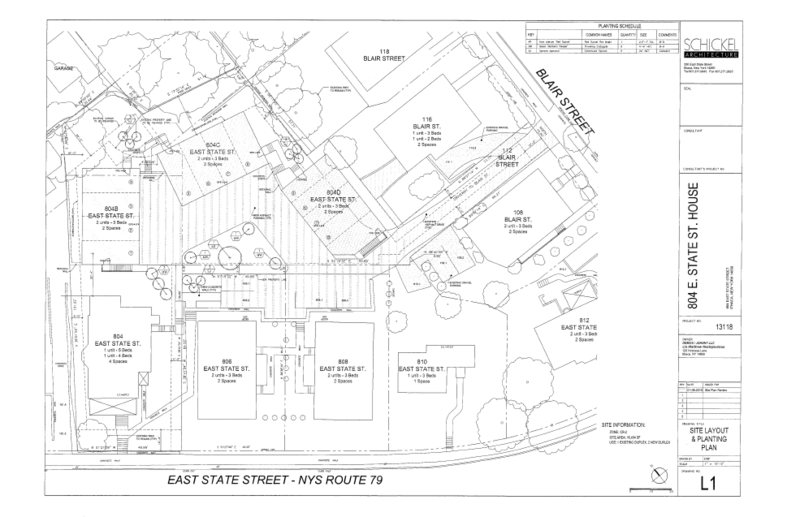 The architect is Daniel Hirtler of Ithaca, and the developers are William and Angie Chen, also of Ithaca. 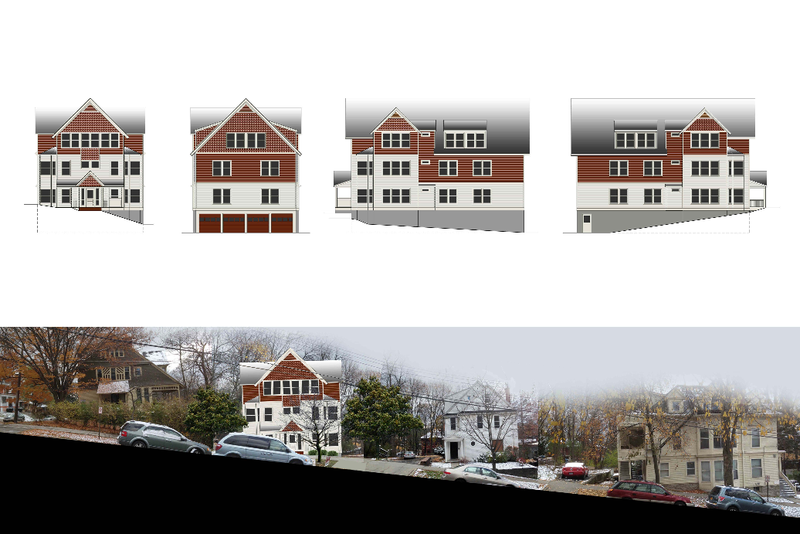 While not particularly notable, it’s an example of how the form-based zoning applied to Collegetown helps maintain the character of the less-dense outer neighborhood, while still allowing for new construction. 4. 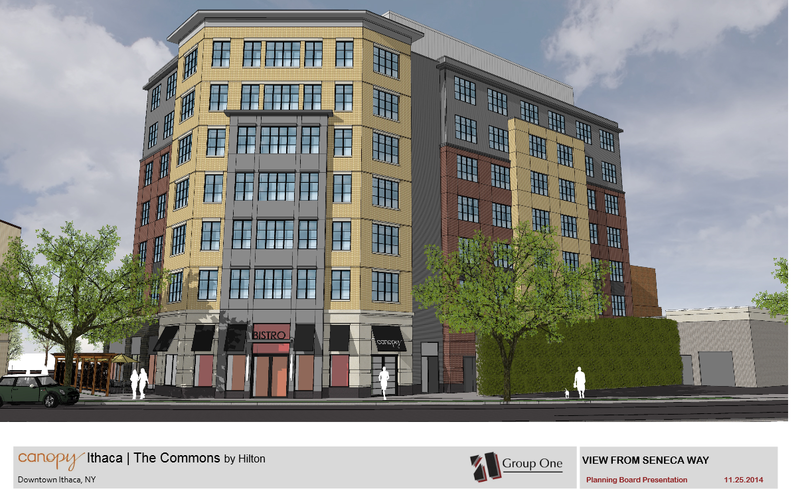 As with virtually every other sizable project in downtown Ithaca, the canopy Hotel by Hilton is filing an application requesting a tax abatement through the CIITAP program, making it the sixth applicant since the revised program was put into affect in 2013. Application here, and the notice of public meeting, set for 5 PM February 9th at City Hall, is here. A refresher/review of CIITAP can be found here. The applicant, “Ithaca Downtown Associates LLC”, a.k.a. the Patel Family of the Baywood Hotels Inc., notes that the 7-story, 123-room hotel project has an estimate cost of $20.15 million. Although the value of the tax abatement is not recorded in the city’s application (it will be written out, when reviewed by the county IDA), it looks like they’re seeking the standard 7-year abatement, which will save them something in the ballpark of a couple million dollars over those 7 years. As with the previous Marriott and Hotel Ithaca applications, the applicant will only pay one-third to one-half of its projected employees a living wage, which is probably going to earn them the scorn and opposition of the Tompkins County Worker’s Center. 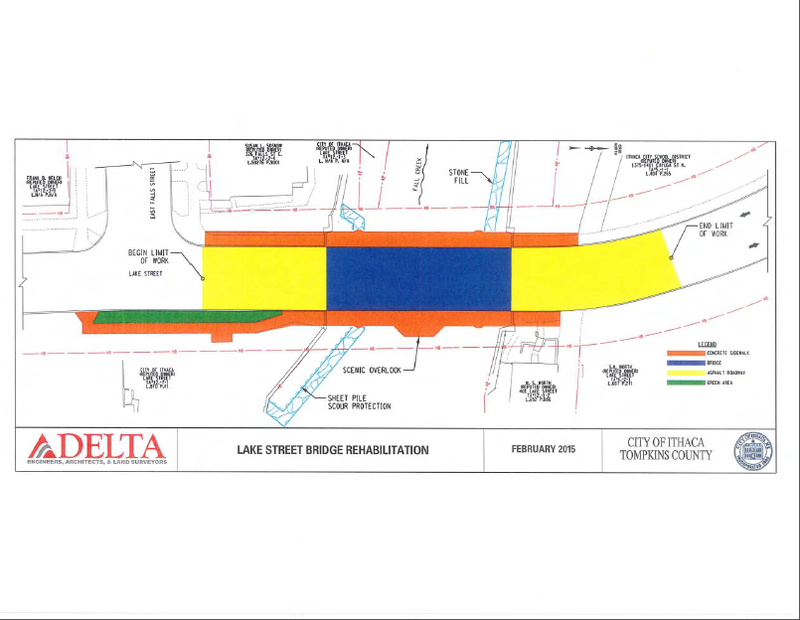 But the city and Downtown Ithaca Alliance have been supporters of the project. Neighboring businesses seem to be have mixed opinions about the project, with some seeing a potential business source, and others mourning the loss of a convenient parking lot. The 74,475 sq ft project is expecting to start construction during the spring, with completion in Spring 2016. Local firm Whitham Planning and Design is the architect. For those already planning a stay, expect room rates of $160+/night, according to the Journal. 5. It’s PSA time again – INHS is planning meeting #4 for its proposed Neighborhood Pride redevelopment at 4:30 PM Wednesday the 11th, inside the vacant Neighborhood Pride grocery store. The one and only final design concept, shaped by community feedback, will be presented at this meeting. Keep an eye on the Voice for an article (and maybe a rerun here) next Thursday or Friday. 6. Looking at the city’s project memo going out to its departments, it doesn’t look like a whole lot needs to be reviewed this month. 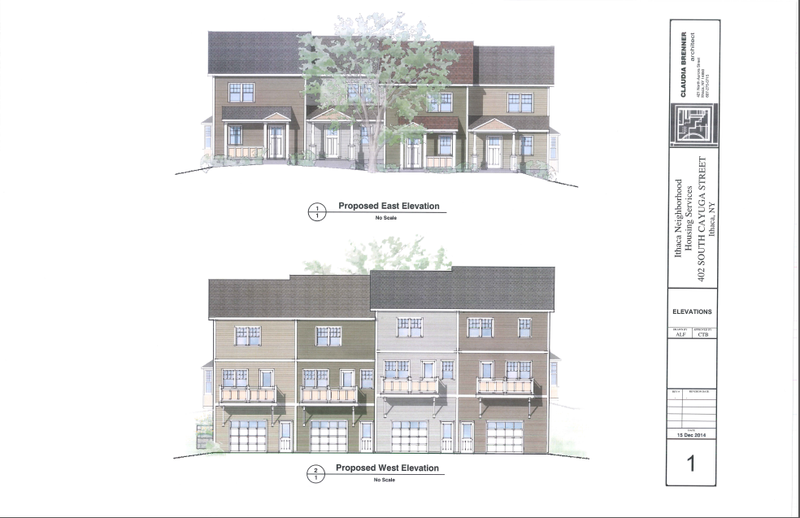 Cornell’s Upson hall renovation, the 6-unit building at 707 E. Seneca, and the 4 for-sale townhomes INHS wants to build at 402 S. Cayuga Street are ready for final approval this month. 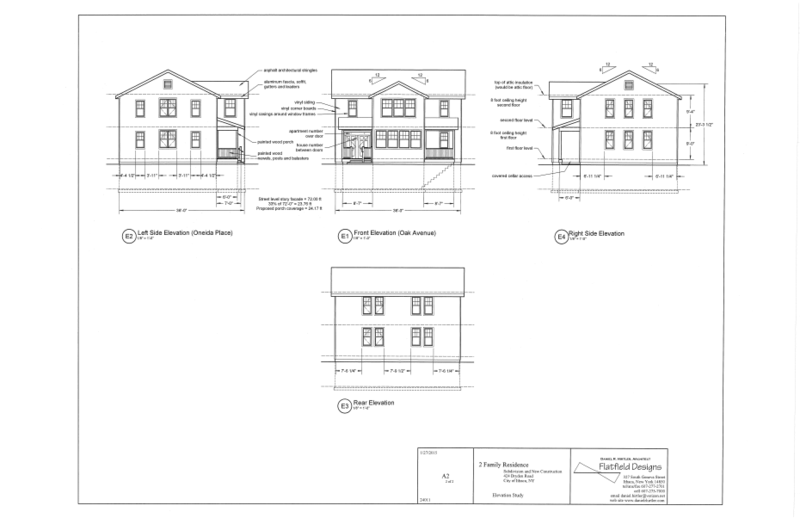 The 3-building, 6-unit project for 804 E. State (112 Blair) still needs to be reviewed by the zoning board, and will be completing environmental review (SEQR determination of significance). The only new projects of note are the new house at 424 Dryden, and renovations to the Lake Street Bridge. The bridge project consists of rebuilding the current deteriorated bridge with a new deck and refurbished abutments (base supports), as well as scour reinforcements (to protect from creek erosion), a bumpout for viewing Ithaca Falls, some cute light-posts, and a bridge span that isn’t so degraded that it’s liable to collapse into the creek. That project has a $1,000,000 price tag, and is expected to run from June to November of this year. For those that use this bridge, start prepping for a detour route – the bridge will be closed during construction, to both vehicles and pedestrians. The city estimates the detour will be an extra 1.7 miles for cars, and 0.7 miles for bikes and walkers. I saw that this weekend. Like Jason said in reply to the tweet, it’s piling work to prep the Carey Building for its addition. Canopy will most likely start in late March. This winter has been horrendous. Stupid jet stream.